This LPD DVD release is the earliest known live concert footage of the band, recorded live at De Vrije Vloer in Utrecht, Holland on January 21, 1987. 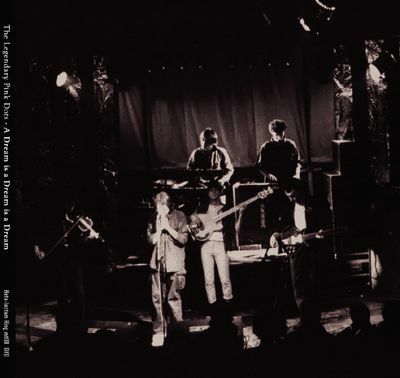 At that time the LPDs were a six-piece band consisting of Edward Ka-Spel (vocals), Stret Majest (guitar), Patrick Q. Wright (violin), Silverman (keyboards), Graham Whitehead (keyboards), and Jason Salmon (bass). The amateur video is a bit grainy because of the low light conditions, but the audio is excellent. The DVD contains the entire concert of 16 songs sampled from their catalog at the time: Curious Guy/Premonition 16 EP, Under Glass/The Light in My Little Girls Eyes/Plasma Twins EP, Asylum, Island of Jewels, The Tower, Faces in the Fire, Curse, and The Lovers. It is wonderful to see the band captured in time and to watch Patrick Q. Wright play the violin, a band member many fans would wish rejoin the Dots. His violin added a dimension to their music that is sadly lacking today. The only drawback to the DVD is Jason Salmon’s unintentional, but distracting comical appearance on stage. Jason’s wearing of high water jeans, vest, and fedora along with playing his bass high on his chest and dancing to the music is just out of place with the cool performances of his band mates. Though probably not the best place to start for the LPD newbie, this DVD is sure to please the horde of Dots fans that can not get enough of their music.